We've been living/working in our motorhome full-time since July 2003, our house sold in November of that year. We've been on the road since April 2004. Our life's story, since deciding to become RVers, is on our Blog! It's a wonderful thing for fickle memories. "When were we at Devil's Tower?" "I don't know - check the weblog!" The archive at right is the easiest way to see something in our past. The primary organization is by month. Click on any month to see all entries for that month. The later entries are at the top of the page, as you scroll down, you are going back in time. We keep this Blog for ourselves, our family and friends. But, anyone else who is interested ... Welcome to our adventure! If you click on the title of a post, it will take you to the individual page for just that one post, then, at the bottom you'll see a link to 'Next' or 'Newer' post. Click on that and it's like turning the page, you'll get another individual post page. This way, you can read the blog like a book. You can start at the beginning (April 5, 2003), or any point in time, and just keep turning the pages. Don't attempt to read the whole thing in one sitting! As of November 2013 there are 1,613 posts. At first this was a 'personal' blog only. I used it like a journal, I wasn't even sure I would tell anyone it was there. Well, maybe just family and close friends. Then, I wrote a little about the work we were doing. Hmmm, is this a personal blog or a business blog? I finally decided that it's both. That s a great thing about our lives, we blend personal and business. We love what we do and we do what we love, and we write about all of it! In 2006 we developed our Geeks on Tour business website and now publish most of our computer related info there. And, in 2011 we started our business Facebook page. If you're going to start reading the current blog entries, you could use the 'Cliff Notes' of what the story is about! I'm Chris. I'm the one who likes to write about my life. (I have journals and diaries going back to about 8 years old!) My husband is Jim. You'll see an ocassional entry in the weblog from him as well. Odie is the dog. You won't see any entries from him (he has his own blog :-), but rest assured he is always there behind the scenes. One of the reasons we like RVing is that your dog can come with you! And, he is so happy to be with us all the time. We used to call ourselves'Odie's Roadies', we see it as our job to drive this little dog around the country. Unfortunately, due to old age and poor health we let Odie pass on March 12, 2013. We lived and worked and played (scuba diving mostly) in Fort Lauderdale, Florida for many years. Jim and I met when I owned a computer training business, Computer Savvy, and he worked for the company that built the computers we bought for our classrooms. 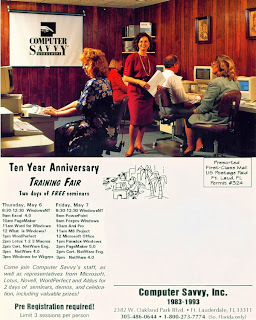 Computer Savvy operated from 1983 - 1996 when I sold the business. Both Jim and I are computer consultants and, after selling Computer Savvy, we got married and started our own business, Guld Systems, Inc. Jim helped small companies with all their network and hardware needs, I did custom programming using Microsoft Access. Jim's son, Devon, lived with us. We always had a 'someday' dream of becoming vagabonds in a motorhome. our dream if only we could figure out how to make a living while we roam the highways of America. I need is an Internet connection. Jim's work involved physically 'touching' the computers. day he had the idea, "I could set up wireless networks in RV Parks!" and had the house up for sale. then they would collect fees from the RVers who used the system. We were skeptical. In 2004, Jim handled all the tech support phone calls from Wi-Fi subscribers. We also gave presentations at RV Park trade shows. In 2005 we made a point to visit all Coach Connect parks around the country, offering staff and customer training, support, and troubleshooting. That kept us so busy that we couldn't do much of the travel we wanted. In 2006, we left the full-time work but still represented Coach Connect by giving seminars at big RV rallies like the FMCA. Seminars are what we really love doing the most. I am doing more and more website work. We've developed our own business identity as 'Geeks on Tour: Computer Training for Travelers'. Our 3 areas of focus are 1)Seminars at Rallies, RV parks, and Computer Clubs 2)Video tutorials and books online and on CDs, and 3)Writing articles on computers and travelers. We're still primarily dependent on our savings for paying the bills, but we're on the path to a self-sustaining lifestyle. We sure hope it works because we love living on the road!